This is the quintessential location on . 84 of an acre for a charming, completely updated, brick ranch home on coveted Cherryville Road. Personal residence of a luxury homebuilder. The extraordinary gourmet kitchen and great room addition with walls of glass doors opening to the beautiful back yard is perfect for buyers who love to entertain and enjoy a peaceful and serene setting with 255 feet of Highline Canal trail frontage that provide a recreational bonanza! 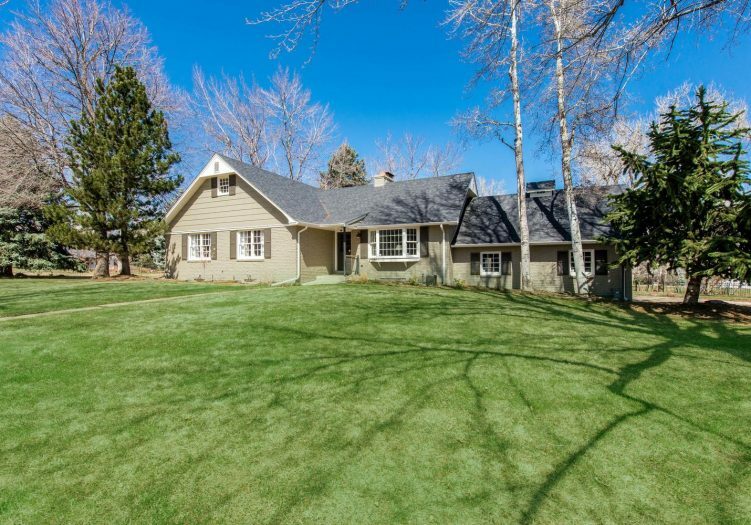 This main floor master home has new baths and hardwood floors throughout. Basement level has been completely redone with new bedroom, bath and clever Murphy beds in the recreation room with fireplace and drop-down media screen and projector. Traditional home with a contemporary flair and custom industrial urban chic railings make this home feel like it belongs in a design magazine. Perfect for today’s styling! Enjoy the cul de sac location and separate two-stall barn for animals or additional storage! This is a true find!